An augmented projection in which a simulation relates to a real place. Software makes possible the simulation, rather than mere representation, of the world around us. In this project you will model a creature or organic system by developing an interplay of simulated forces. In this assignment, you will use simulation to create a creature or system of creatures. For example, you might make a swarm of bees that respond to the cursor and seek flowers. Or, you might make a blobby octopus that uses spring forces to create stretchy, bouncy tentacles. Or, you might model a spider’s web as a mesh of connected springs, subject to forces of gravity, wind, and the jiggling of insects that get stuck to it. For this project you are asked to create a creature, living thing, or ecology which generates form and/or behavior, algorithmically, and (with strong encouragement) through some form of simulation. Your job, Dr. Frankenstein, is to create new life — such as an interactive and sensate creature, a dynamic flock or swarm, an artificial cell-culture, a novel plant, etc. Please give some consideration to the potential your software can have to operate as a cultural artifact. Can it somehow attain special relevance by generating things which address a real human need or interest? Using ScreenFlick or other screen-capturing software, record 20-60 seconds of video documenting your project. Upload this to YouTube. If your project doesn’t require any special libraries, upload it to OpenProcessing. In a blog post, embed your YouTube video. Also in the blog post, embed your OpenProcessing applet. Also, in the blog post, include some scans of your sketches, and a 100-word discussion of your project. Label your blog post with the category, Assignment-07-Life. In this assignment, your challenge is to create an augmented projection that relates to a specific location. First, please familiarize yourself with contemporary idiomatic uses of augmented projections. Here are some examples, below. Keep in mind that some of these are sophisticated projects made by very experienced practitioners. You have to start somewhere. In your mind, contrast the simple and clever approach of Gysin+Vanetti’s Casse with the high-budget, visual-effects-heavy approach of AntiVJ’s Omicron. You will make a small poetic gesture projected on a wall. Look around and find a wall with some modest features that catch your eye — such as a power outlet, doorknob, water spigot, elevator buttons, etc. Sketch some concepts for some poetic ideas that could relate to those features. Now simplify your idea. Now simplify it again. A note about the scale of this project. You are asked to create the equivalent of a rhyming couplet, not an epic opera. Not even a limerick or a haiku. Just get some virtual objects responding to some wall features. Simplify, simplify, simplify. You will create an augmented projection using the physics library Box2D, that relates to a specific location. To ensure that your registration is good, you will projection-map it onto that location using the Keystone library. Install the Keystone library in the libraries folder in your Processing documents directory. Box2D is a physics library for collisions between 2D shapes. You will be using the version of that library built for Processing, called PBox2D. Install the PBox2D library in the libraries folder in your Processing documents directory. For essential viewing: Browse and run all of the examples that come with PBox2D. Perhaps one of them will suit your concept well. Perhaps one of the examples will inspire an even better idea. Find a location with some features to project on or around. Boring is better! Measure the wall features in order to obtain their accurate proportions and relative sizes. For example, I measured a wall outlet to be 70x115mm. When I rendered it using graphics, I made a rectangle which was 70×115 pixels. Get it? Design a simulation that relates to the wall features. Borrow a projector, an extension cord, and (if necessary) a magic arm with which to mount the projector. Also, make sure you have a video camera of some kind (your mobile phone is fine) to document the results . With your laptop, project your simulation onto the wall. Calibrate your projection using Keystone, so that everything lines up. Record some video. If necessary or appropriate, provide a little narration over the video to explain what’s going on. Upload your video to YouTube. Describe your project, the problems you solved, and what you learned doing it. Discuss your inspirations (include sketches) and aspirations: how might the project develop further? Label your blog post with the category, Assignment-07-Projection. Here’s some example code to get you started. // This project renders PBox2D objects in a Keystone-warped world. // Initialize the Keystone offscreen buffer etc. 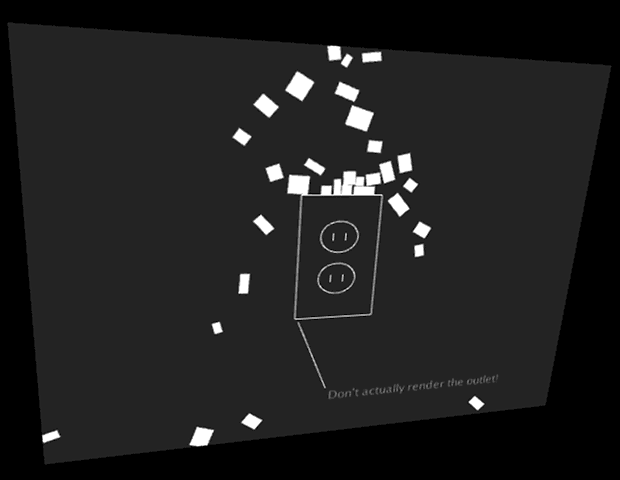 // Initialize box2d physics and create a world with gravity. // We must always step through time! // Is the particle ready for deletion? // Is it off the bottom of the screen? // Notice how we do all the drawing in Keystone's offscreen buffer!